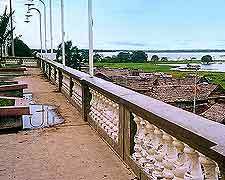 There are many places of interest and colonial tourist attractions to be found around the Plaza de Armas in Iquitos city centre and lining the nearby riverfront, which retreats somewhat during the summer months. Close by, a walk along the Malecon Tarapaca and around the Belen Quarter of Iquitos will reveal a neighbourhood quite unlike any other that you will have ever seen before, while family friendly tourist attractions include the Amazon Animal Orphanage, the Pilpintuwasi Butterfly Farm and the Quistococha Lagoon. With so many places of interest and quality Amazonian attractions spread all around the Iquitos area, it makes a lot of sense to make use of the plentiful tour operators, who will help you to make the most of your time spent exploring Peru's northern rainforest. 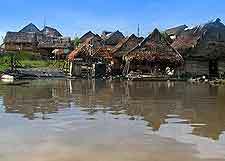 Belen is best described as a floating shanty town, with rustic houses standing on wooden stilts or rafts, with the entire area being flooded by the Amazon River for much of the year, particularly during the rainy season. Around 7,000 people currently call this part of Iquitos their home, with traditional canoes often floating between the huts, selling their very own Amazonian jungle produce. Tourists will find that the unusual attractions within the Belen Quarter are best viewed early in the morning, at around 07:00, when market traders from neighbouring villages arrive. A great way to tour the area is by guided canoe, and these are available for hire at Belen's port (Puerto Itaya). 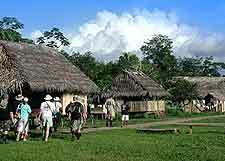 A variety of day trips, jungle packages and cruises on the Amazon River are on offer, with tourists favouring destinations such as the Allpahuayo Mishana National Reserve, the Pacaya Samiria National Reserve (see below), and also the Tamshiyacu Tahuayo Reserve. 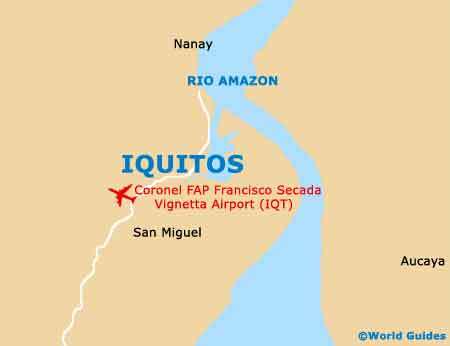 Do be sure to only use recommended tour operators, and if possible, use one of the indigenous residents as your personal Amazon tour guide. The Malecon Tarapaca is a very special trail alongside the south-easterly river banks and was created during the affluent period of the rubber boom. Offering a peaceful place to stroll and some very pleasant panoramas, the Malecon Tarapaca stretches from just below the Plaza de Armas, leading right up to the Belen Market, running parallel to the Prospero. 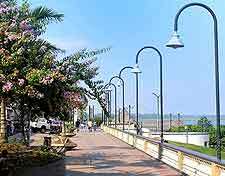 Malecon Maldonado offers a very scenic riverside walk on the eastern side of central Iquitos and serves as the city's main promenade, leading on from the adjoining Malecon Tarapaca and passing many attractions along the way, such as the Fitzcarraldo Restaurant. Tourists may know this pedestrian only trail better as the Maldonado City Walk and will often find lively street entertainers performing to small crowds, usually juggling, singing, playing panpipes or dancing with giant snakes, all of which creates something of a carnival atmosphere. Highly suitable for all ages, the Amazon Animal Orphanage is a recommended attraction for many different reasons, and conveniently close to Iquitos, residing in nearby Padre Cocha, alongside the Nanay River. Visitors will be able to see a small collection of native wildlife, with each of the animals having been rescued after losing their mothers. Tapirs, anteaters, red uakaris and even a capuchin monkey can all be observed close up in their spacious surroundings. Adjoining the Amazon Animal Orphanage is the ever-popular Pilpintuwasi Butterfly Farm, which serves as a breeding centre for some extraordinarily beautiful Amazonian butterflies. Around 40 different species of butterfly are kept in a large enclosure where visitors are able to walk freely, often being followed by wild monkeys on the roof. 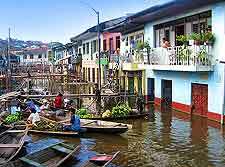 From Iquitos, the simplest and most scenic way for tourists to reach these attractions is to hire a motor boat from the Bella Vista Port. 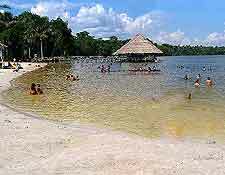 The Quistococha Lagoon is really a must-see and lies on the outskirts of the city, some 7 km / 4 miles from Iquitos proper. Tourists flock here during the Peruvian summer months (December to March), sunbathing on the golden sands of its artificial beach, before cooling down in the adjoining tranquil waters of the lake itself. Families will particularly enjoy the animal attractions at the Quistococha Zoological Park, which has been open since 1979 and covers around 900 acres / 360 hectares in total. Visitors to the zoo will find many creatures indigenous to Peru and the Amazon Basin, such as monkeys, snakes, alligators, parrots and tapirs, together with a very well-maintained botanical garden. If you don't have time to make the zoo, you may well be able to spot the wild monkeys living in the trees around the Quistococha Lagoon.